It was a typical fall morning in early September.The first of the fall freshets had risen the rivers slightly and my hopes were high that fresh Steelhead had moved into my favorite local river.I woke up early, fixed my coffee and was out the door by 4:00 a.m.. My goal for that day was to fish for Steelhead. Immediately after arriving at my destination, my stomach started to churn in anticipation of a fruitful day.I donned my waders, threw on my boots, and laced up my rod.It was still dark and I had a half-mile walk to the river.The sweet smell of fall was in the air and I thought to myself, “Damn, it’s nice to live in the Pacific Northwest!”There is a crispness in the air that tells you that fall is here, and along with it, the best fishing season of them all. Before I even set foot down the trail, I just had a feeling that something was going to change me forever.Sometimes you just know that things are going to go well. I followed the path adjacent to the small creek that would meander and join the large river downstream. The sun was just beginning to peak through the early morning mist. The spot that I had chosen to fish had held Steelhead before, and I knew that they would sometimes nose into the small stream and decide whether nature had intended them to progress or stay in the main stem and head further up river.As soon as I arrived, I made a couple of casts, and proceeded to use the traditional wet fly swing in hopes of enticing a Steelhead to my fly. On about my 6th cast, as I began to retrieve my line in prior to my next cast, I observed a bright silver fish of about 10 lbs. in hot pursuit of my fly.For a brief moment, the fly connected with the fish but in an instant, the fish leapt once and was gone. For the next few moments, I tried to put together what had just happened.What fish would have chased my rapidly retrieved fly? As I observed the water more closely, there were about 10 fish rolling downstream like the fish that I had just hooked. At this point I realized that they were undoubtedly Coho and over the next half an hour, I continued to work my fly as I had done with the first fish and managed to hook 6 more Coho, landing none of them.Each would take the fly ferociously, leap once or twice, throw the hook, and be gone, leaving me shaking with excitement. The next day I returned to the same spot where the action had taken place the day before, but the water was empty.Two more days I made the same one-hour drive but came up empty handed, no fish hooked and no more obviously rolling about.It was as though a phantom had plagued my imagination and now the phantom was gone.About two more weeks passed when I made the same trip back and it was on this day that I finally hooked and landed 2 bright Coho bucks of about 10 lbs. each.These fish were the stuff of dreams. They took the fly with ferocity, and once hooked, leapt about like nothing I had witnessed before.The water was thrashing, the fish twisting, rolling and jumping with such power I wondered if I would ever land one of these fish.It was this day that made me love Coho Salmon. Coho Salmon, Oncorhynchus kisutch, or Silver Salmon as they are also called, get their name from their beautiful silver sides.They are well known in certain angling circles for their aggressive behavior and for their jumping and rolling tactics once hooked.They vary somewhat in size, depending upon the river, and range from 7-20 lbs or so, with 10-12 lbs being average.Coho will spend 12-18 months in fresh water before their journey to the sea where they will become adult fish.Like other Pacific Salmon, they return to their natal streams in the fall to spawn and it is during this return that they make such great quarry for the adventurous fly angler. 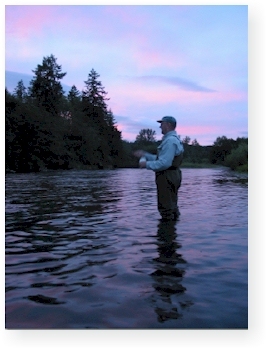 Like other Salmon and/or Steelhead fishing, run timing varies on each river system and it pays to do your research before you head out the door.Many river systems see relatively early returns of fish in September through October.Other systems are known for their late returning fish, giving fly anglers and shot at dime bright Coho through December. For equipment, a 7- or 8- weight rod will handle these fish nicely.Multi-tip fly lines are an obvious advantage to Salmon fly fishing and I prefer the Rio Versi-tip system as it allows me to change the head portion quickly with changing depths and/or water conditions.Of the various tips offered, I do 90% of my fishing using the type II head and a tapered 9- foot, 10 lb. Salmon/Steelhead leader of which I’ll add another 2 feet or so of 8 lb. Maxima. 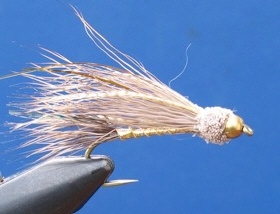 For flies, it’s hard to beat a Rolled-Muddler Minnow and/or flash flies in an assortment of colors.Hook size can be very important, start with a 4 and see how it goes.Smaller flies may often lure fish to strike, but lacking the wider gap, they often don’t hold.In addition to flash flies, egg-sucking leaches and/or green wooly buggers can also be effective. Coho can be finicky, slamming anything and everything put in front of them one moment, and then becoming extremely tight lipped the next.Fly color and speed of retrieve may make or break a day.During some outings one may observe Coho chasing a fly 10 feet or more before engulfing it, truly a spectacle to behold.On other days, one leaves the river perplexed as to what would make these fish follow a fly.You just never know what makes these fish “turn on”, but when they’re on, there is nothing quite like it.It is this endearing trait that makes me love them all the more. Like Steelhead fishing, rain can liven things up or slow things down.Salmon are programmed to head up river as far as possible so that they can spawn and nothing says this louder than when rivers are rising.During rising water, the fish will shoot through the systems paying little attention to flies.In sharp contrast, during those drought years, fish will often come into the system and become dour while they wait for the rivers to rise.Dour fish will generally refuse flies as well.You’ll want to time your fishing when the rivers have risen and begun to fall as this will set things up perfectly for some hot action.Some days will produce nothing while others will wear your arm out. Salmonids all prefer different locations in the river system and my best success at catching Coho has been to fish in relatively slow currents.Once you’ve found the slower currents, you’ll want to look for rolling and rising fish as they are always a good indicator that fish are present.Cast just beyond the rolling fish, let your fly settle, and then vary your retrieve.You’ll want to experiment with different retrieves, various depths, and fly colors.Often times, one color will work for awhile and then the fish will be looking for something different so it pays to keep changing up if the action slows down. 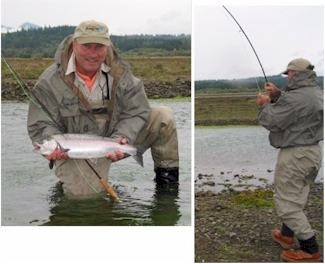 So if you're looking for one of the hardest fighting fish around, look no further than fly fishing for Coho Salmon. These wonderful game fish are just what every fly fisherman are looking for, they are strong and aggressive. Not everyday will bring a fish to hand, but those days that do work out will be cherished for a lifetime.